Epiphone presents the new Epiphone Stagebird™ 6-String Electric Banjo, a one of a kind 6-string banjo featuring the new state-of-the-art Magnetic Stagebird™ humbucker that lets you plug in and bring that classic Epiphone banjo tone to any size stage. 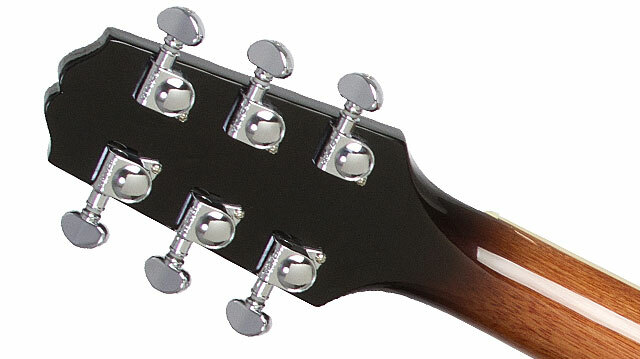 Plus, world famous Grover® Mini-Rotomatic tuners with small buttons for easy tuning, distinctive black Remo® banjo head, and the historic “Dovewing” headstock design with "Epiphone" banner logo. In the 1920s, Epi Stathopoulo formed Epiphone, a new company inspired by his family’s long tradition of building and repairing acoustic instruments. In the thriving musical world of Manhattan, Jazz was the defining music of the times and the banjo was the main rhythm instrument of jazz bands. Thanks to Epi Stathopoulo’s many banjo patents and his flair for design, Epiphone’s new line of modern banjos quickly became the industry standard, respected for their full tonal range, great intonation, craftsmanship, and ornate designs. Now the Epiphone Stagebird™ 6-String Electric Banjo brings that historic sound and style to a new generation. 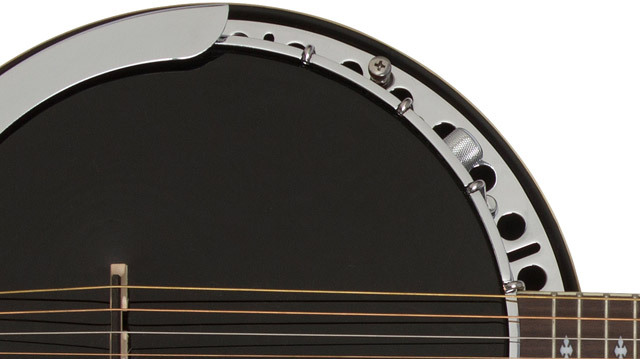 The new Epiphone Stagebird™ 6-String Electric Banjo has a classic 5-string banjo profile but with 6-strings so guitarists can play chords and single-string runs with superior Epiphone banjo tone. The Stagebird features a Mahogany Resonator with a Red Brown Mahogany gloss color finish and single layer binding. On the front is a nickel armrest and an eye catching black Remo® head which provides maximum volume and tone acoustically along with a hard Maple bridge with an Ebony cap. 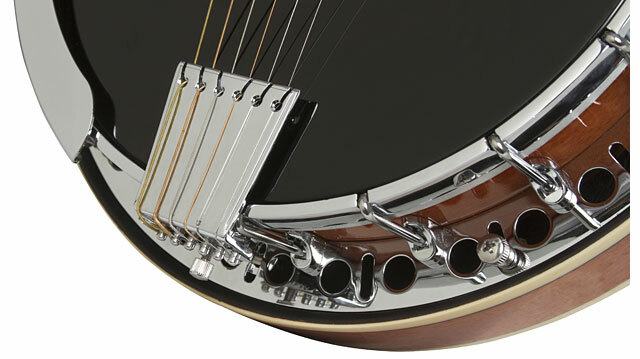 The adjustable tailpiece accepts both loop and ball-end banjo strings for maximum total choices when choosing strings. The Mahogany neck has a 25.5” scale with a SlimTaperTM profile with dual coordinator rods for full and even intonation everywhere on the neck. 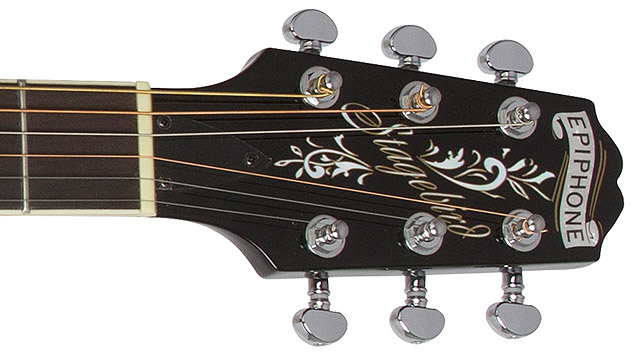 The fingerboard has 21 medium frets and a 25.5” scale with a traditional Epiphone “Snowflake” fingerboard inlay. The beautiful headstock recreates the traditional look of late 20s and 30s Epiphone banjos with “Stagebird” in period script along with the iconic Epiphone banner. The Stagebird weighs around 8.75 pounds. An optional hard case is available. The 6-string Stagebird™ Electric Banjo still retains its classic tone when plugged in thanks to a Magnetic Stagebird™ humbucker, designed by Epiphone to accurately pick up the Stagebird’s historic tone. The pickup features an Epiphone all-nickel ¼” output jack along with a simple master control.